Today I thought I'd share some beautiful vintage wedding dress sewing patterns from the 1930s-1950s for you DIY brides out there. Although wedding season has typically been a spring time thing, in recent decades, brides have started planning their special day during colder months as well. In fact, October is one of the biggest months for gettin' hitched. I love wedding planning so much that I became a certified wedding planner shortly after I got married but we soon had a baby and I was able to pursue my real dream job of being a stay at home mom. Sometimes I still do love to look at this season's wedding trends and of course, see what all of the modern vintage brides are doing! 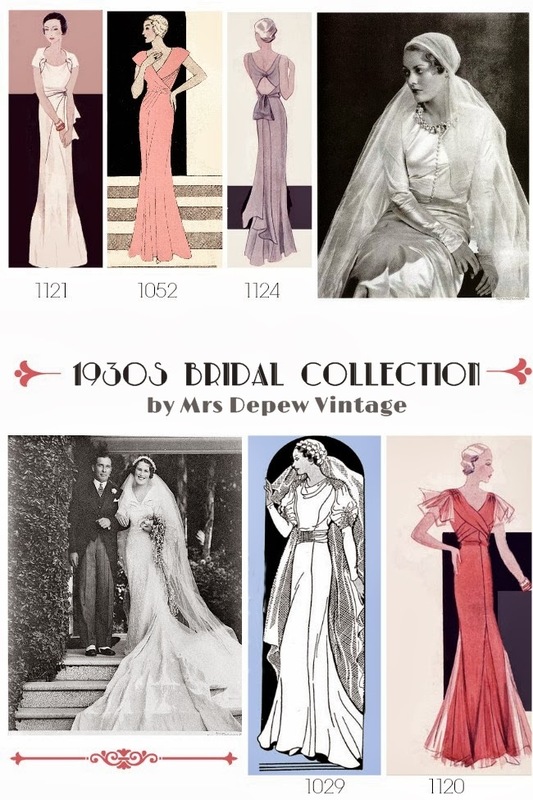 Anna of Mrs Depew Vintage recently added a beautiful collection of vintage wedding gown patterns to her pattern shop. With these PDF patterns, brides can draft-at-home in any size for a custom fit with a perfect vintage look Anna provides an excellent F.A.Q. article on her draft at home system. If you're a 1930s bride, pair a sleek and elegant gown with a flowing veil. Try mantilla styles or pin a simple veil to a white calot or floral band. Many 1920s and 30s brides pinned the veil into a Juliet cap with the sides framing the face. Cascade bouquets were a popular style for this decade. For drama, add a long and elegant train and long sleeves to any of these styles. 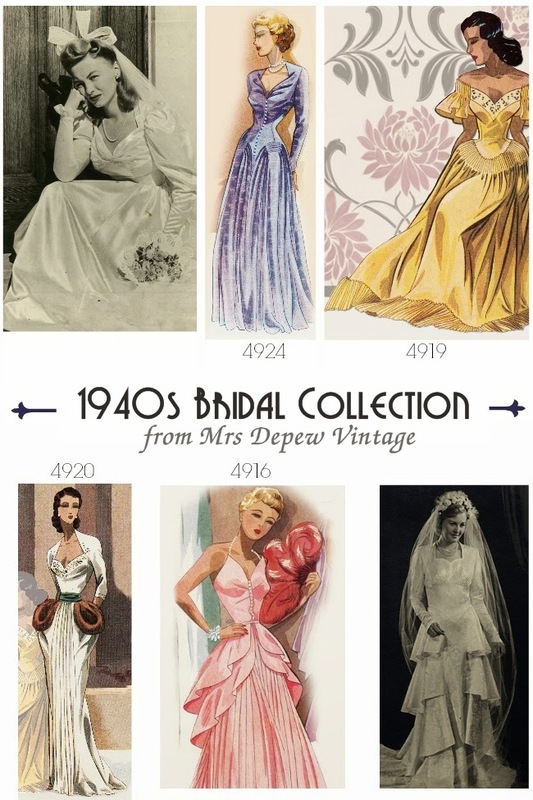 The 1940s bride enjoyed all kinds of bridal silhouettes from sleek and sophisticated to voluminous layers and peplums. Sweetheart necklines and long sleeves were often the norm for this decade. For style 4916, add a crisp white bolero, which can be removed later for the reception. Attach a cathedral or layered fingertip veil to a beaded crown, floral headband or heart-shaped halo headpiece. Simple round bouquets with a lace-trimmed holder were popular in the 40s but an extravagant bride may still carry a dramatic cascade. 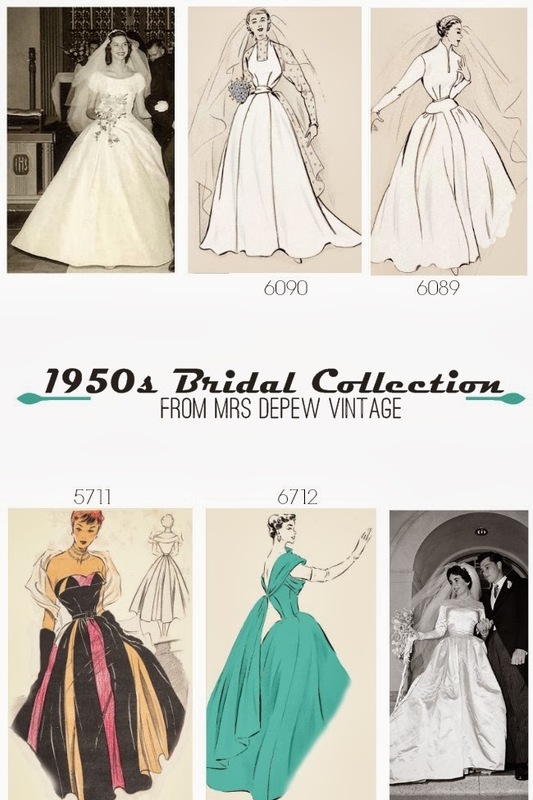 The 1950s were a grand time to be a bride. With the war over, sweethearts tied the knot left and right and brides took advantage of the ability to use plenty of fabric. Choose a very full skirt with plenty of layers in your crinoline. 1950s brides embellished with lace overlay, beaded trimmings and light embroidery. For your veil, indulge in long layers or take a hint from modern vintage brides with the popular below-the-knee dress and short veil. Bouquets became smaller in the 50s to balance out those plentiful yards of satin and netting. what a great post!! I got married just over four years ago and my dress was a pattern from 1957. I loved this! Really fun to read the trends from the years past. If I'm going to be married someday I want to be a 30s bride! Love those gowns! Looking at these brides (Oh, so many brides..) I get the feeling of goosebumps. I get those all the time - every single wedding I go to, I stare at the bride; their dresses amaze me. Now being the '30 and '40 gal, I prefer more reduced style: less material, less puff.. but, GOSH all of these ladies look dashing! I love looking at vintage wedding photos, especially the 1940s and 1950s ones. Some lovely dress patterns too.